Kansas City Chiefs’ running back Spencer Ware had an up and down fantasy football season this past year, and was one of the most sought after running backs going into the season, in part to the lingering injuries for Jamaal Charles. As a late round pick (round 10) in some leagues, Ware delivered value. He finished RB16 and RB17 in Standard and PPR leagues, respectively. 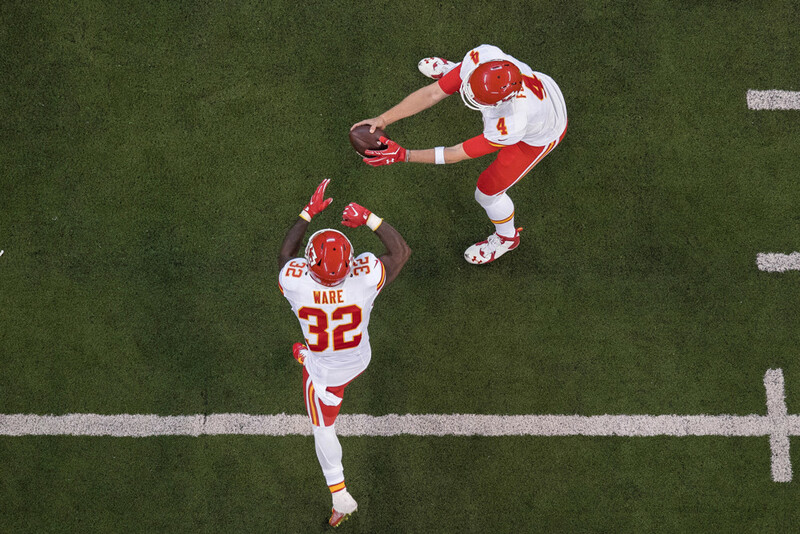 Through the first seven weeks of the 2016 season, Ware ranked 8th in standard fantasy points across running backs while averaging an impressive 5.2 yards per carry (YPC). Ware suffered a concussion in week 8 and was never quite the same. From week eight onward, Ware’s rank dropped to 23rd, and his YPC dove to 3.7. By season’s end, Ware finished with 5 total touchdowns (3 rushing, 2 receiving) which was a let down for a near 1,000 yard running back. Ware is currently the 15th running back off the board and has a current ADP of 3.07. The graph below shows his decline in fantasy football ADP over the past month. Data is from 12-team standard mock drafts. 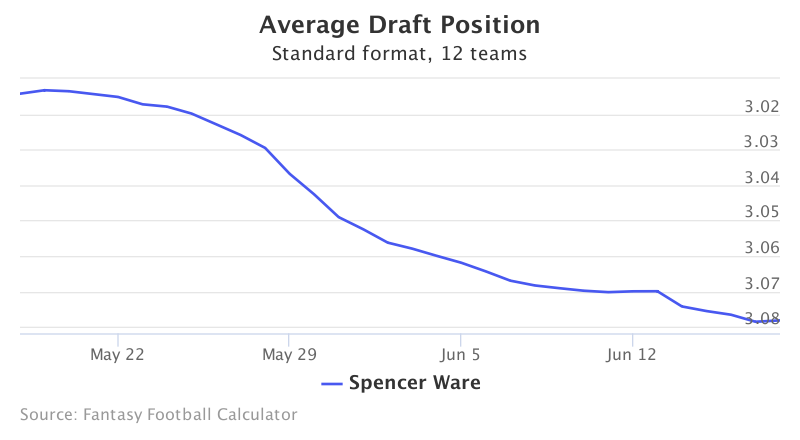 Ware’s ADP has dropped almost a half round over the past month. This can partially be attributed the early praise rookie running back Kareem Hunt has received in OTAs from the coaching staff. The optimism doesn’t stop there, as Hunt’s ADP has risen a full 3 rounds over the past month, and is now being drafted as the 11th pick of the 10th round (118th overall). Splitting carries with Hunt will ultimately hinder Ware’s ability to finish in the top 12 as an RB1 next season. At his current price, other notable running backs with similar ADP are Isaiah Crowell (3.04) and Carlos Hyde (3.08). However, if you went running back heavy in the first two rounds, receivers available are the likes of Doug Baldwin or Alshon Jeffery. Starting with Ware as your first running back chosen may seem unsettling. However, if his ADP keeps falling leading up to fantasy drafts and there is no indication that Hunt has overtaken him as a starter, Ware may turn out to be a steal this season, especially if he is able to return to his form from the first seven weeks in 2016.